Are we merely victims of circumstance, or can we actually create our own destiny? Are past, present and future happening simultaneously? Do our beliefs create our reality? The answers to these questions and many more can be found within. Merging a sense of fun and real life anecdotes with deep esoteric philosophy, this is a book that has evolved over thirty years of spiritual study and deep contemplation, offering assistance to all who seek the answers to living effective lives in ‘Earth School’. Metaphysics, or the art of ‘Acting As If’, is the universal tool of creation. Its mastery, achievable by anyone with an open mind, will open doors you may not have previously imagined. Whether you want to be the master your own success, heal past hurts, improve your relationships or simply find a greater sense of inner peace, one thing’s for sure: this book will definitely change your perspective. It might even change your life. Paul L Bennett AKA The Cranky Guru is what you might call an all-round creative: a graphic designer, professionally trained opera singer, artist, violinist, one half of blues band Dog On Holiday, and published author. 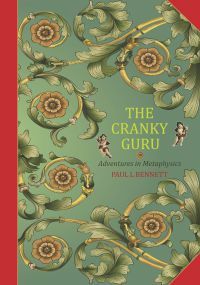 His loving family coined his name ‘The Cranky Guru’ after deciding that while Paul deals in ‘love and light’, he is every bit as fallible – and prone to cranky outbursts – as the rest of us. Still, it’s what makes his insights into metaphysics and living beyond your potential all the more real and engaging – something his thousands of Facebook followers will attest. His trademark humour, warmth and wisdom will have you grasping life with both hands and achieving the destiny of your dreams – with gusto!